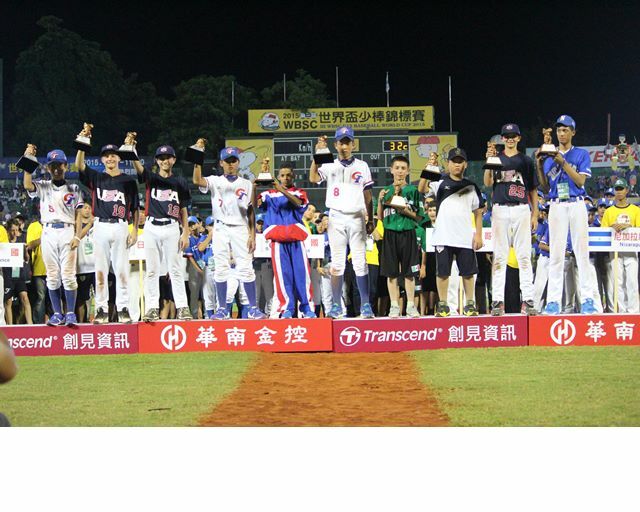 TAINAN, Taiwan -- The United States U-12 National Team won the III WBSC U-12 Baseball World Cup 2015, defeating hosts Chinese Taipei, 7-2, before a record sell-out crowd of more than 11,000 fans at Tainan Municipal Stadium Sunday evening. The Game 50 final between host Chinese Taipei and the U.S. in Tainan was the highest-ever attended U-12 Baseball World Cup game since the launch of the elite youth world championship in 2011. More than 150,000 online and mobile viewers worldwide followed the live webcast of the final. The U.S. repeats as World Champions in the 12-year-old age category, having won the 2013 U-12 Baseball World Cup in Taipei City. The U.S. will also be entering the 2015 WBSC U-18 Baseball World Cup, which opens later this month in Osaka, as the defending World Champions. Chinese Taipei defeated Cuba to win the inaugural U-12 Baseball World Cup in 2011 and has since fallen to the U.S. in the finale of the event’s last two editions. In Sunday’s bronze medal match, Nicaragua made history, earning its first-ever medal in a Baseball World Cup with a 2-0 shutout victory against Cuba. The Nicaraguan U-12 National Team, which has attracted widespread support from fans and media in the Central American country. National audiences in Nicaragua were able to watch the broadcast of the “Nicas” at the U-12 Baseball World Cup in Tainan. The Nicaraguan U-12 National Team will be given an official ‘welcome back’ upon their return on home soil on 4 August. The next two editions (2017 and 2019) of the WBSC U-12 Baseball World Cup will also be held in Tainan. The 2015 WBSC U-12 Baseball World Cup "All-World" Team was announced following the end of the U-12 world championship that saw the U.S. defend its world title, defeating host Chinese Taipei, 7-2, Sunday night. Five of the 12 nations in Tainan had players selected to the top team. The World Champion U.S. and runner-up Chinese Taipei National Teams led the international selection with three players each – accounting for six of the 10 players earning All-World honors.